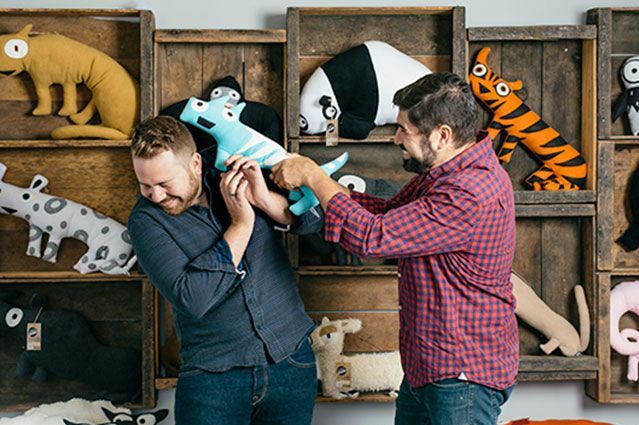 Partners Andrew Ruesch and Plinio Garcia, two UCLA alumni, make cute stuffed toy endangered animals. A portion of their profits go to nonprofit wildlife organizations. Buy an adorable stuffed toy, help an endangered species. That’s the concept behind the wildlife-themed line of stuffed animals manufactured in Los Angeles by Indy Plush, a company launched by two Bruins and their son’s kindergarten teacher. Garcia and his partner, Andrew Ruesch, who received his B.A. degree from UCLA in 2011, seized on the idea of building a stuffed animal business after their son Luke came home from kindergarten with a handmade dog. Partnering with Luke’s kindergarten teacher, Franceil Masi, Garcia and Ruesch started Indy Plush in their garage and nearly sold out the first batch of self-designed creatures at Venice’s Abbot Kinney Festival. In 2014, Indy Plush went national when Whole Foods agreed to carry 14 of the soft-bodied toys, a stuffed-animal menagerie that included Giant Panda, Grizzly Bear, Javan Rhino, Bengal Tiger, Puma, Mountain Lion, Leatherback Turtle, Eastern Lowland Gorilla and Hammerhead Shark. In 2015, the chain carried an even broader range. “Getting our toys into Whole Foods was huge, because their mission is to give back, and that’s just what these toys do,” says Ruesch, who also works as a reality TV development executive. 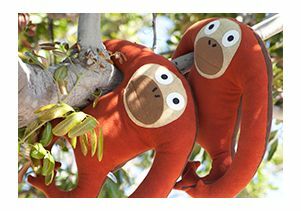 Indy Plush, which sells both online and out of its showroom at Fisherman’s Wharf in Marina del Rey, shares 15-20 percent of its proceeds from the Endangered Species toys with nonprofit wildlife advocacy groups. For example, partner Orang Utan Republik Foundation receives a cut each time Indy Plush sells an Orangutan doll. Other partners include Shark Angels and the Dian Fossey Gorilla Fund International. A Green America Certified company, Indy Plush hews to eco-friendly manufacturing standards, using recycled plastic bottles as filler and keeping packaging to a minimum. To drive home its environmental message, Indy Plush attaches an informational tag to each “endangered” toy.